The Denver Christkindl Market is underway at Skyline Park in downtown Denver and this lively European style Christmas market has become a tradition in our house and something we eagerly look forward to every holiday season. Tired of strolling the mall for the perfect gift? The Christkindl Market has vendors selling goods that you won’t find anywhere else. I’m not much of a shopper, but even I love browsing the Christkindl Market. Last year I found a gorgeous German lace scarf for my mother and colorful nesting dolls for our niece. Need a cuckoo clock? They’ve got those too. The Denver Christkindl Market comes alive after dark. Twinkling lights add to the festive mood. Photo courtesy of the German American Chamber of Commerce – Colorado Chapter. As fun as it is to shop at the Denver Christkindl Market, I really go for the food and drink. GlÃ¼hwein, a traditional German mulled wine, is my favorite and it flows freely under the Entertainment Tent at the market. My husband, Ryan, prefers the German beers that are also sold under the tent. The food is another delightful treat at the market. I’m obsessed with Chef Neuhold‘s salmon, so I get the same dish every year, but there are many traditional German and European foods to be eaten here. You can also indulge in pastries galore and of course, there are always pretzels bigger than your head from Styria Bakery. 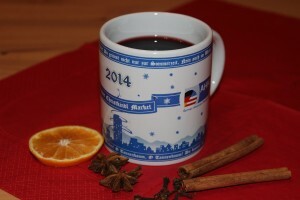 GlÃ¼hwein, a German mulled wine that’s perfect on a chilly winter evening. No trip to the market is complete without a stop in the Entertainment Tent – this is, after all, where they serve the wine and beer – and on a cold day it’s toasty inside the tent. As most of you know, I love a good German polka number and a bit of dancing. 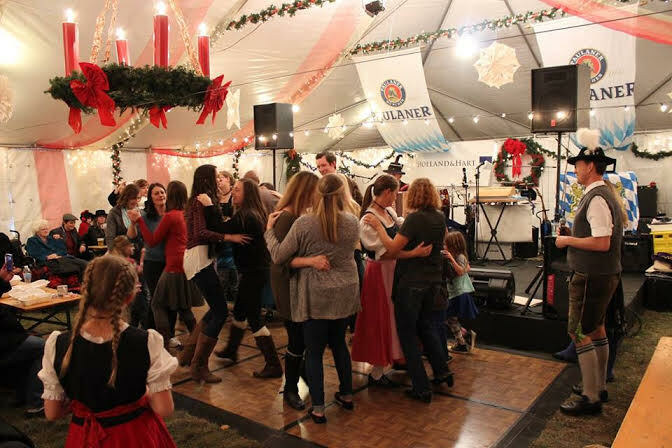 It’s under the Entertainment Tent where my favorite summer party, Biergarten Festival, and Denver Christkindl Market, come together. Some of the same lively bands and dancers make an appearance. Dance troupes such as the TEV Edelweiss Schuhplattlers and the Chalet Dancers entertain the crowds. And bands like Rick Borger and the Average German Band and Steve Rock keep the crowds dancing. Dancing under the Entertainment Tent at Denver Christkindl Market. 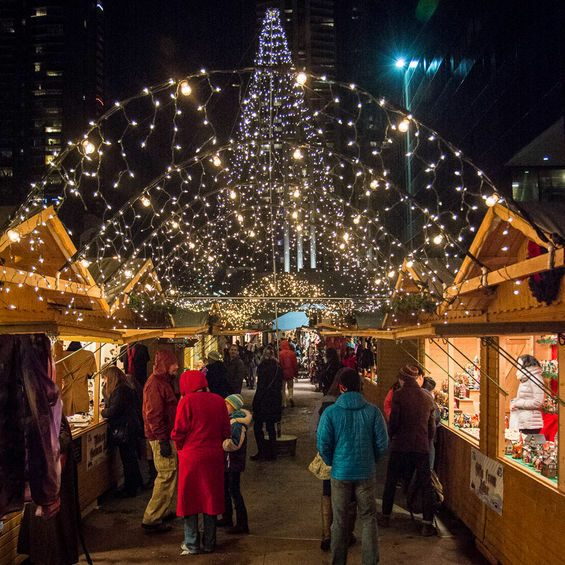 Head to Skyline Park this season and start making your own Denver Christkindl Market memories. Entry to the market is FREE and it runs through December 23, 2014. It is open Sunday through Thursday from 11 a.m. to 7 p.m. and Fridays and Saturdays from 11 a.m. to 9 p.m.
Skyline Park is located at the 16th Street Mall and Arapahoe Street. Join the DCM on Facebook here.